From its humble beginnings in Naples, Italy, pizza first came to America in the 1800’s. But this dish we all know and love didn’t really become popular until the mid-1900’s when—rumor has it—that soldiers returning from Europe after WWII were craving Italian food. Today, the American pizza industry spends about $40 billion annually on ingredients, with approximately 75,000 pizzerias around the country. Though most pizzas are a simple combination of flour, water, salt, and yeast, various regions have created their own styles that each bring something new and unique to the table. 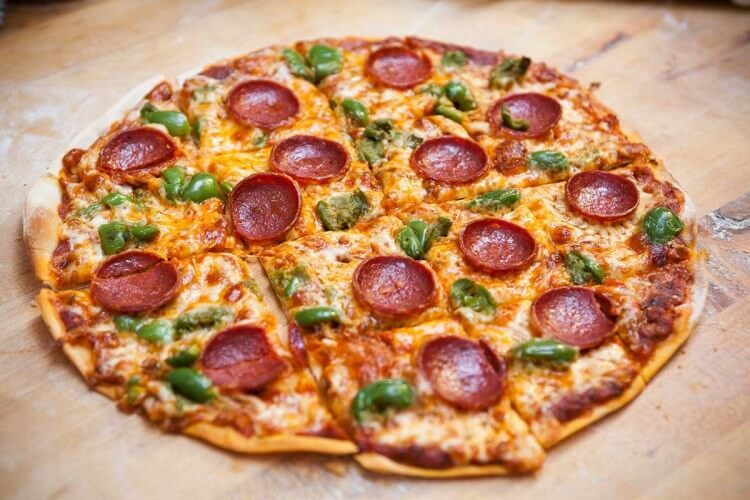 Choosing which types of pizza are the best is just too hard, so we suggest you go ahead and try them all! New York pizza is known for its large slices that are thin, foldable, and deliciously greasy. It stems from the Neapolitan pizza that Italian immigrants brought to NYC. In 1905, America gained its first pizzeria, Lombardi’s, by Gennaro Lombardi, in the Little Italy neighborhood of Manhattan where slices were sold for five cents. Sugar and olive oil are usually added to high-gluten bread flour to make that perfect crust dough which is then hand-tossed. Many New Yorkers claim that the unique taste of the crust is because of the minerals that can only be found in the city’s water. And that melty greasy cheese comes from grated low-moisture mozzarella. The city is dotted with hundreds of little pizzerias, which in their truest form sell pizza, and only pizza. For the most quintessential slice of New York pizza, check out Joe’s Pizza in Greenwich Village — it’s open until 2 AM if you’re craving a late night snack. There are few things that are as central to Chicago as deep dish pizza. This pizza is unapologetically indulgent with a thick buttery crust, chunky tomato sauce, and oozing mozzarella (and some Italian sausage for a true experience). Pizzeria Uno first cooked up this deep dish pizza in 1943. Due to its thickness, deep dish pizza takes longer to cook than thin crust pizza, so the cheese is placed under the sauce so that it doesn’t burn. The crust then gets this delicious crunchy texture, making you want to devour your entire slice. While there are many places to get Chicago-style deep dish, Lou Malnati’s is famous for its handmade pizzas, exclusive sausage blend, and the secret recipe for flaky buttery crust that has been passed down for generations. Their crust is so good they had it trademarked — Buttercrust™. In the 1940’s, a bar owner Gus Guerra and his wife Anna decided to throw some of her mother’s Sicilian pizza dough into a square pan that was originally used to carry auto parts – and thus the Detroit-style pan pizza was born. Today this style of pizza is baked in a well-oiled and seasoned pan, once before and once after the toppings are added on. The edges and bottom are baked until they are crispy and the cheese is usually Wisconsin brick cheese which is mild and perfectly meltable. The end product is then cut into signature square pieces. To get a real taste of the Motor City’s trademark pizza, you’ll want to try Buddy’s Pizza, where this square slice was first introduced. It has the heart of many Detroiters and has won many accolades. Year after year, it continues to be regarded as Detroit’s number one pizza. New Haven pizza, better known as apizza, is the Neapolitan pizza’s grittier cousin. The “a” before pizza comes from the Italian dialect spoken in the Naples region. In 1925, Italian Immigrant Frank Pepe opened Frank Pepe Pizzeria Napoletana where he used a coal-fired oven to create the iconic New Haven pizza crust. The crust is thin, crispy, charred, and typically irregular — it’s hard to find a New Haven pizza that is perfectly circular. Unleavened cracker-thin crust, an herby tomato sauce, and Provel cheese are what make St. Louis-style pizza a Midwest favorite. Provel is the key ingredient in this style of pizza, which isn’t actually cheese — it’s a cheese product similar to Cheese Whiz and Velveeta. It’s a fatty mixture of provolone, Swiss and cheddar cheeses, and liquid smoke — which, while made of cheese, doesn’t technically meet the requirements of what cheese is according to the FDA. Their circular pizzas are then cut into square slices, also known as “party squares” so that not every piece has a crust. For some original St. Louis pizza, head over to Imo’s Pizza, which first opened its doors in 1964 and boosted the pizza to popularity. This smoky flavored pizza style is loved by many, and criticized by many — but love it or hate it, it’s iconic to the Gateway City. California pizza has a thin crust similar to a Neapolitan pizza, but what sets it apart are the non-conventional toppings, focusing on seasonal and artisanal ingredients. First conceptualized in the 1980’s by chefs Alice Waters of famed Chez Panisse and Ed LaDou of Prego restaurant, and popularized as a food trend by California Pizza Kitchen, these wood-fired pizzas are now a cultural phenomenon. Goat cheese? Figs? Arugula? Nothing is off limits when it comes to these experimental culinary creations. A great place to try some California pizza is Spago, a Wolfgang Puck restaurant, where LaDou was hired to be a pizza chef. He created a delicate pizza topped with smoked salmon. While working here he also developed the iconic BBQ Chicken Pizza that put California Pizza Kitchen on the map.